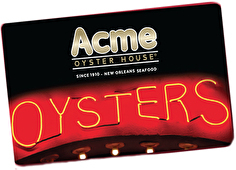 For over 100 years, Acme Oyster House® has been satisfying the hungriest of people all over the world! It's quality you can taste in the fresh, hand-shucked Louisiana oysters. Whether served ice cold on the half shell, chargrilled and sizzling in garlic butter or fried to golden perfection, Acme oysters are some of the best you'll ever have. And it's not just the oysters, we're serving all of the New Orleans classics like red beans and rice, seafood gumbo, jambalaya and more, all seasoned to perfection and served with a smile. Your friends and family will light up when you give them a gift card to Acme Oyster House®! Whether they are into ice-old oysters, or a delicious, golden fried oyster po-boy, this gift card will be sure to satisfy all their cravings! For balance inquiries call the phone number to a Acme Oyster House's location below.